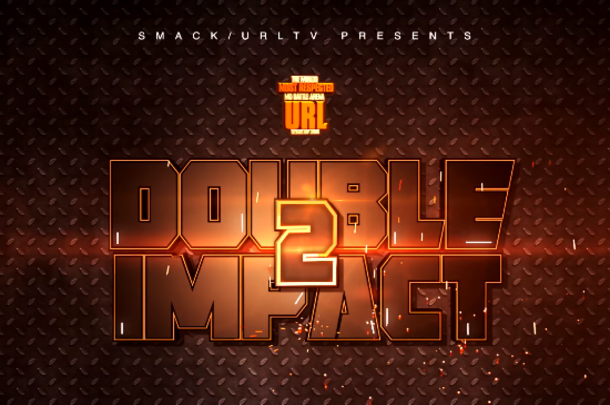 When URL announced Double Impact last year, it was during a time where 2-on-2 battles were becoming common, with NWX's DNA & K-Shine being one of the primary reasons for their surge in popularity. This made the Double Impact event relevant within the zeitgeist of battle rap, at that time. Perhaps the most surprising battle on the card involves the return of St. Louis emcees Hitman Holla and Aye Verb. While the two are among the most talented battlers of all time, personal issues that they had with URL had many within battle rap speculating that they would never return to the URL stage. With Holla's full time role on Wild n' Out, and Verb indicating that he would be retiring soon, that seemed even more inevitable. In Holla and Verb's only other battle together, they put on one of the best 2-on-2 performances in history against DNA and K-Shine. Facing them are the talented Brizz Rawsteen and T Top. Both guys since they debuted on URL have been taking out top tier battlers one by one, with few exceptions. If they get Verb and Holla at their peak form it may be a long night for the Carolina emcees, but if the St Louis pair slip even a bit, they may become the latest victims of Top and Brizz. Also returning to the card is arguably one of the most important battlers in Smack history, Math Hoffa. Hoffa's last appearance on the URL stage was a disappointing showing against T Top at "Unfinished Business 2." He and Cortez will be facing off against two emcees who almost always steal the show on the URL stage, Rum Nitty and Ill Will. Team Homi members Ill Will and Rum Nitty will be looking to make a splash in their first time teaming together. Both guys are talented, the only question is: Will their combined efforts be greater than the some of their parts? Last Double Impact, we saw Tay Roc and Tsu Surf team up for the first time, and they chemistry was amazing, so there is a precedent for the notion working. If they do have issues with chemistry though, look for the longtime friends who have teamed together previously, Hoffa and Cortez, to take the W.
Elsewhere on the card we have a practical who's who, with Arsonal & Suge teaming up, X-Factor & Midwest Miles returning to the URL stage, and two NWX teams battling. (Dna/K-Shine & Big T/Saga). Every single battle on the card has potential to be a classic, and if everyone brings their A game, this could have event of the year written all over it. Predictions? Let us know in the comments below.